Accessory: 4 Luxe Fringe/Tassel Earrings Worth Having! 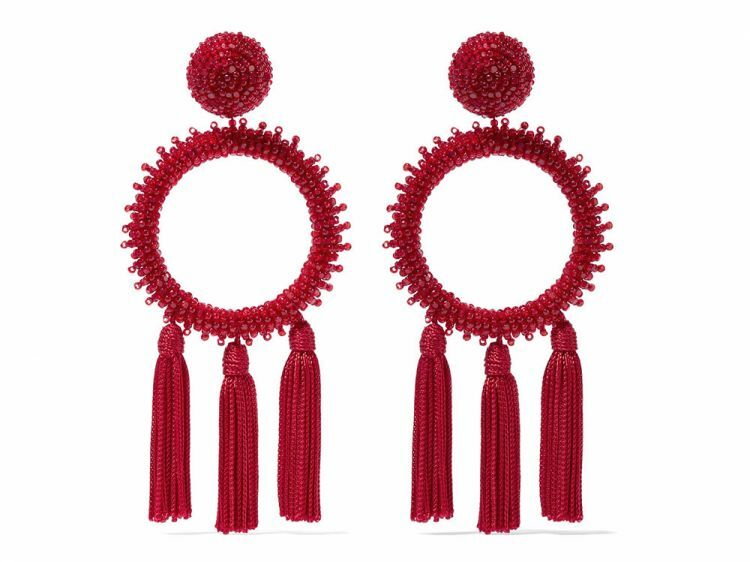 Fringe earrings or tassel earrings are having a moment this year thanks to Oscar de la Renta for showcasing his version of luxe tassels in beads and silky threads. The catch phrase “go long or go home” must have been coined from that time. For his Spring 2017 collection, the fringe or tassels were styled on a tube dress making the tassels vulnerable to admiration. However, there’s a striking trait about Saint Laurent’s fringe collection of 2017, it’s just that they are elongated from the ears to the clavicle. That alone makes it such an alluring piece and a must-have to our jewellry collection. Model wearing the gold and black tassels from Saint Laurent Spring 2017 Collection. Oscar de la Renta debuted the intricately beaded tassels. We couldn’t get enough of that yet and then the two-toned beaded tassel/fringe earrings just took our breath away. The tassels/fringe is such a way to make an entrance especially here in Nigeria where you have got a cluster of party squads waiting to dissect your outfit in piece. Start off this trend by looking at some other pieces trending on other luxury site. For Polyvore, here are 5 tassel/fringe earrings you would want to pick at least one! Oscar de la Renta feathered tassels. Hijab & Turban Styles: How To Rock The Athleisure Trend! The Omotoke Bag From TM Luxury Is A Must Have This Season!